NEW YORK (WABC) -- The NYPD announced street closures for the New Year's Eve Celebration in Times Square. Street closures and parking restrictions are expected to cause traffic delays. The use of public transportation is highly recommended. Beginning at 4 a.m. on Thursday, December 31st, Times Square will be closed to vehicular traffic. At approximately 11 a.m. attendees will be directed by police officers to gather in separate viewing sections. When one section reaches capacity, people will be directed to the next viewing section. As the evening progresses, revelers will continue to populate Times Square along Broadway and Seventh Avenue moving uptown from 43rd Street to Central Park. - 59th Street between 5th Avenue and Columbus Circle. - 46th and 47th Streets, from Sixth to Eighth Avenue. - 43rd to 47th Streets, from Sixth to Eighth Avenue. 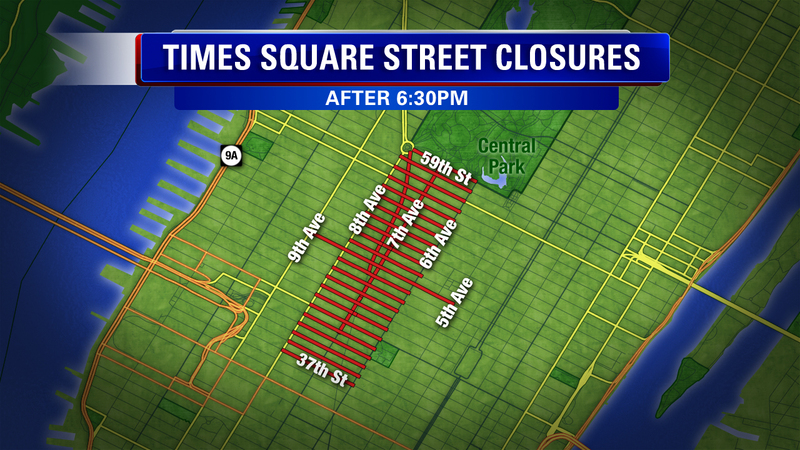 Beginning at 5 p.m. on Thursday, December 31st, 42nd Street from 6th to Eight Avenue will be closed to traffic. - Cross-town access for emergency vehicles will be available on 42nd, 48th, and 59th Streets. - Southbound and northbound N/R/W lines will bypass the 49th Street station beginning at 7 p.m., Thursday, December 31st until approximately 12:15 a.m., Friday, January 1st. - The northbound IRT "#1" train will bypass the 50th Street station beginning at 7 p.m., Thursday, December 31st until approximately 12:15 a.m., Friday, January 1st.